How do you implement a CRM that is useful and specific to your business? What must happen to motivate your people to fully embrace and utilize the CRM? Can accountability be increased with a proper implementation or re-implementation? How to you ensure that everyone on the sales team is following the same steps in the sales process and not interpreting? What milestones and stages must be established to ensure that an accurate forecast is produced? The Novation Selling framework can be implemented into your existing CRM system, or you can use Salesforce CRM with the Novation Selling framework built-in to immediately boost your accuracy and accountability. With this framework integrated in your CRM, your company’s forecasts, pipeline, sales stages and milestones are understood by all, creating one unified and accessible database to make communication and management incredibly effective. One of our certified consultants works with your sales leadership to identify the sales stages that are specific to your specific environment. Each sales stage is further defined by a step by step set of milestones that indicate the “truth” about the progress of the opportunity, not an interpretation of facts. Naming conventions are established, and documentation is developed to ensure everyone is operating consistently. 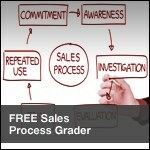 Organization and effective management within every step of your sales process. Complete accountability, accuracy, and predictability. Elimination of micro-management leads to better results and happier people. One single repository for all sales and service related information. Realtime Business Intelligence to improve your competitive stance.